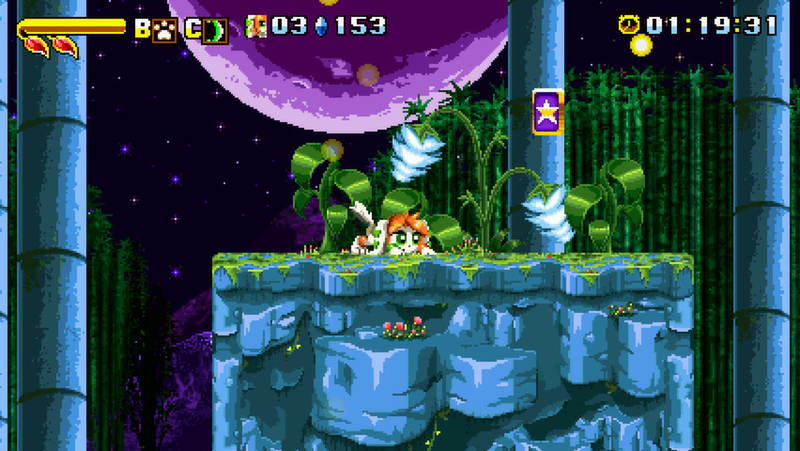 Freedom Planet, the first effort from new studio GalaxyTrail, is a throwback character platformer that started life as a Sonic the Hedgehog fangame, but quickly grew into something much bigger. An original world, original characters, and original content were all created for the project, and the result was compelling enough to find success on Kickstarter. Now the game is coming to Wii U, but how does it hold up to the influx of other indie titles arriving on Nintendo’s platform? Freedom Planet tells the story of dragon Sash Lilac and wildcat Carol Tea, who rescue a mysterious creature named Torque from the wreckage of a crash-landed spaceship. Torque warns the duo of a threat to the Kingdom Stone – a precious artifact that doubles as a source of pure energy – prompting Lilac and Carol to rush to the Kingdom Stone’s resting place and warn the authorities of the plot. The game then proceeds to take you on a whirlwind tour of the planet’s major power centers: the lavish, gilded streets of Shang Mu, the airborne, peace-loving kingdom of Shang Tu, and the fortified palaces of the militaristic Shuigang, whose king was recently assassinated by an unknown assailant. The varying locales hint at a world more developed than the plot has time for, lending a solid sense of place to the setting. Similarly, the plot itself is fairly simple but hints at much deeper pre-existing relationships between several of the characters. In that way, it manages to be surprisingly interesting without really getting in the way of the gameplay. I found myself not as intrigued by the story proceedings as I was by the characters who acted it out and the world it was set in. And that world looks absolutely lovely. 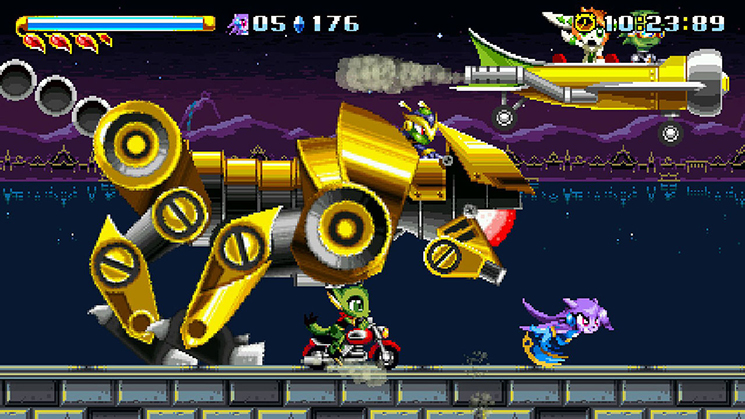 Retro-styled indie games are a dime a dozen, but few are as visually arresting as Freedom Planet. It captures the distinct look and feel of a Genesis or Game Boy Advance platformer and then aggressively beautifies it. It’s stylistically similar to what Shovel Knight accomplished for the NES aesthetic – there are just enough reused set pieces and large, exaggerated features to fool you into thinking you’re playing a retro game, but it simultaneously harnesses the power of more modern hardware to create genuinely stunning scenes. GalaxyTrail clearly recognizes that games like Sonic The Hedgehog or The Revenge of Shinobi weren’t visually successful just because they ran at a low resolution. If you, like me, have grown tired of the cynical use of pixel art to evoke a foundationless sense of faux-nostalgia, then Freedom Planet will be an absolutely liberating breath of fresh air. The gameplay of Freedom Planet is often compared to that of Sonic the Hedgehog, and it’s clear that a lot of inspiration has been drawn from the classic Sonic titles. But to call it a “Sonic clone” would be a disservice to both games, because once you pick it up and start playing, it’s clear that Freedom Planet is a fundamentally different game. 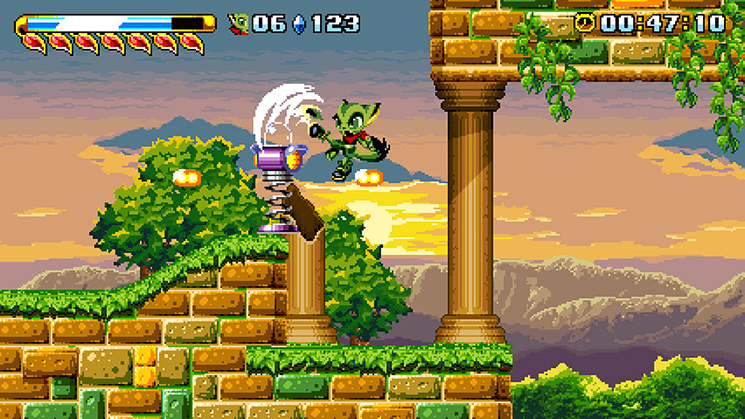 Whereas Sonic and friends had movesets that prioritized quick building of momentum and blazing speed above all else, the abilities of Freedom Planet’s three playable characters revolve around the quick and effective traversal of obstacles. You’ll often have to slow down to attempt a tricky platforming sequence or fight a difficult enemy, and it’s still a lot of fun because the characters are equipped to handle it. From Lilac’s midair dash attack to Carol’s wall kicks to Milla’s energy shields, you’ll have to learn and use every tool you’re given. Sonic would not do well in this world, nor would Lilac do well in his. So Freedom Planet is certainly different than Sonic the Hedgehog, but is it better? Honestly, I think it is. 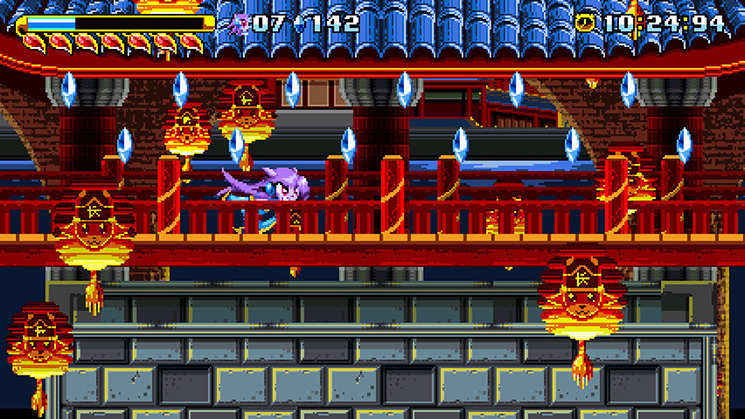 Freedom Planet builds on a lot of things that Sonic got right, for example: cleverly-hidden secrets, the importance of walls and ceilings, and environments designed specifically to show off the grace of the character’s movement. But it isn’t afraid to do away with many of the elements that held classic Sonic back. Sonic’s ability to instantaneously build momentum led to many situations where you’d be happily blazing through a level only to run headfirst into a bottomless pit because you didn’t have superhuman reflexes. Lilac and friends need to work a little harder to get to top speed. This means there are fewer places in the environment where you can really go fast, which in turn means the designers can anticipate this and avoid putting deathtraps in places where they can’t be reacted to. This builds a sense of trust in the player; much like how recent Mario games have easily-identifiable sequences where you can bounce perfectly across several enemies’ heads just by holding the run and jump buttons, you learn very quickly that Freedom Planet isn’t interested in punishing you for accepting its invitation to go fast. 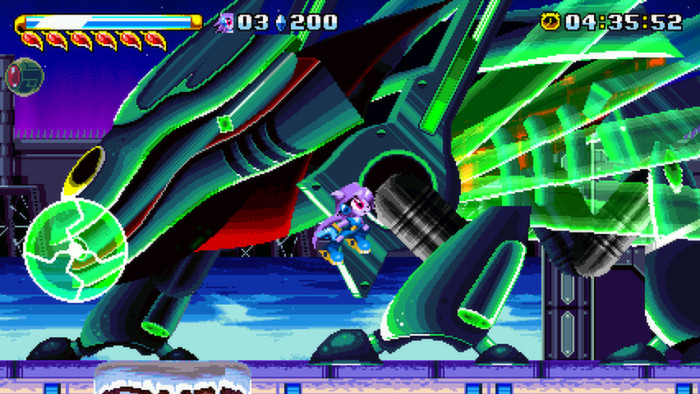 Another area where Freedom Planet transcends its inspiration is combat. All three characters have expansive combat options, which means the enemies can be more varied to match. And the bosses… oh man, the bosses in Freedom Planet are good. They’re far too strong to just brute-force your way through, so you’ll have to actually learn and adapt to their unique attack pattern, developing your own attack pattern in response. It’s so satisfying to get to know a troublesome boss so well that you can eventually bring it down without taking any damage at all. It’s something that, in hindsight, was sorely missing from the classic Sonic formula. Dr. Robotnik was never so formidable as most of this game’s mid-to-late bosses, many of which proved to be some of the most memorable gameplay experiences I’ve had all year. I could go on all day about this game, but the bottom line is that Freedom Planet is an absolute triumph of neo-retro game design. It may have been inspired by Sonic the Hedgehog, but it ends up being so much more than a simple tribute to a classic title: it confidently asserts its own identity while simultaneously celebrating an entire generation of platformers. The game has fun characters, beautiful visuals, and expertly-tuned gameplay that begs to be played, replayed, and mastered. I was thoroughly impressed the entire time I spent with Freedom Planet, and I can confidently say that it’s one of my favorite titles on the Wii U. Every fan of platformers should pick this up as soon as possible. Thanks for the review! Gonna pick this one up today.